1 storage pool (span) configured. 1 file system in this EVS, created without replication target option and should be in mounted state. It is recommended to disable auto-expansion, because the scheduler uses the current free space reported by the file system when creating shares. 1 Management User configured with “supervisor” permission level. Hitachi NAS Management interface should be reachable from manila-share node. Also, if the driver is going to create CIFS shares, either LDAP servers or domains must be configured previously in HNAS to provide the users and groups. This document contains the installation and user guide of the Hitachi NAS Platform File Services Driver for OpenStack. Although mentioning some Shared File Systems service operations and HNAS commands, both are not in the scope of this document. Please refer to their own guides for details. Before configuring the driver, make sure that the nodes running the manila-share service have access to the HNAS management port, and compute and network nodes have access to the data ports (EVS IPs or aggregations). enabled_share_protocols Specify a list of protocols to be allowed for share creation. This driver version supports NFS and/or CIFS. share_backend_name A name for the backend. driver_handles_share_servers Driver working mode. For this driver this must be: False. hitachi_hnas_ip HNAS management interface IP for communication between manila-share node and HNAS. hitachi_hnas_user This field is used to provide user credential to HNAS. Provided management user must have “supervisor” level. hitachi_hnas_password This field is used to provide password credential to HNAS. Either hitachi_hnas_password or hitachi_hnas_ssh_private_key must be set. hitachi_hnas_ssh_private_key Set this parameter with RSA/DSA private key path to allow the driver to connect into HNAS. hitachi_hnas_evs_id ID from EVS which this backend is assigned to (ID can be listed by CLI “evs list” or EVS Management in HNAS Interface). hitachi_hnas_evs_ip EVS IP for mounting shares (this can be listed by CLI “evs list” or EVS Management in HNAS interface). hitachi_hnas_file_system_name Name of the file system in HNAS, located in the specified EVS. hitachi_hnas_cluster_admin_ip0* If HNAS is in a multi-farm (one SMU managing multiple HNAS) configuration, set this parameter with the IP of the cluster’s admin node. hitachi_hnas_stalled_job_timeout* Tree-clone-job commands are used to create snapshots and create shares from snapshots. This parameter sets a timeout (in seconds) to wait for jobs to complete. Default value is 30 seconds. hitachi_hnas_allow_cifs_snapshot_while_mounted* By default, CIFS snapshots are not allowed to be taken while the share has clients connected because point-in-time replica cannot be guaranteed for all files. This parameter can be set to True to allow snapshots to be taken while the share has clients connected. WARNING: Setting this parameter to True might cause inconsistent snapshots on CIFS shares. Default value is False. eth0: Admin Network, can ping HNAS management interface. eth1: Data Network, can ping HNAS EVS IP (data interface). This interface is only required if you plan to use Share Migration. eth1: Data Network, can ping HNAS EVS IP (data interface). You may have to repeat the last line above in another file in the Compute Node, if it exists is located in: /etc/neutron/plugins/openvswitch/ovs_neutron_plugin.ini. Shared File Systems service requires that the share type includes the driver_handles_share_servers extra-spec. This ensures that the share will be created on a backend that supports the requested driver_handles_share_servers capability. For the Hitachi NAS Platform File Services Driver for OpenStack this must be set to False. thin_provisioning = True All shares created on HNAS are always thin provisioned. So, if you set it, the value must be: True. dedupe = True/False HNAS supports deduplication on its file systems and the driver will report dedupe=True if it is enabled on the file system being used. To use it, go to HNAS and enable the feature on the file system used. Restart all Shared File Systems services (manila-share, manila-scheduler and manila-api) and neutron services (neutron-*). This step is specific to your environment. If you are running in devstack for example, you have to log into screen (screen -r), stop the process (Ctrl^C) and run it again. If you are running it in a distro like RHEL or SUSE, a service command (for example service manila-api restart) is used to restart the service. Manila has the ability to manage and unmanage shares. If there is a share in the storage and it is not in OpenStack, you can manage that share and use it as a manila share. Hitachi NAS Platform File Services Driver for OpenStack use virtual-volumes (V-VOLs) to create shares. Only V-VOLs with a quota limit can be used by the driver, also, they must be created or moved inside the directory ‘/shares/’ and exported (as NFS or CIFS shares). The unmanage operation only unlinks the share from OpenStack, preserving all data in the share. service_host Manila host, backend and share name. For example ubuntu@hitachi1#HITACHI1. The available hosts can be listed with the command: manila pool-list (admin only). protocol NFS or CIFS protocols are currently supported. share_id Manila ID of the share to be unmanaged. This list can be fetched with: manila list. 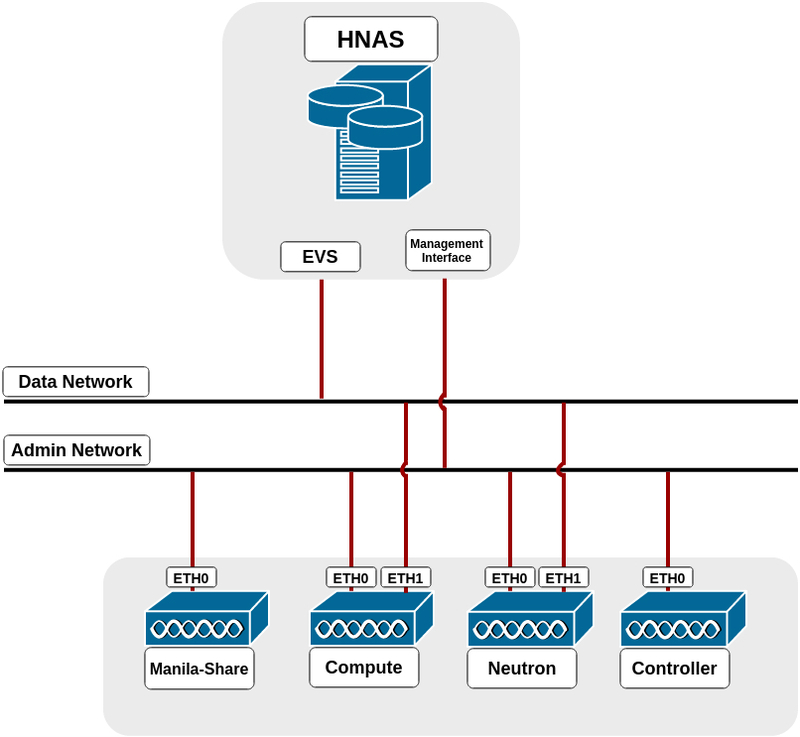 HNAS has some restrictions about the number of EVSs, file systems, virtual-volumes and simultaneous SSC connections. Check the manual specification for your system. Shares and snapshots are thin provisioned. It is reported to manila only the real used space in HNAS. Also, a snapshot does not initially take any space in HNAS, it only stores the difference between the share and the snapshot, so it grows when share data is changed. Admins should manage the tenant’s quota (manila quota-update) to control the backend usage. By default, CIFS snapshots are disabled when the share is mounted, since it uses tree-clone to create snapshots and does not guarantee point-in-time replicas when the source directory tree is changing, also, changing permissions to read-only does not affect already mounted shares. So, enable it if your source directory can be static while taking snapshots. Currently, it affects only CIFS protocol. For more information check the tree-clone feature in HNAS with man tree-clone. 3.0.0 - New driver location, implemented support for CIFS protocol. 3.1.0 - Added admin network export location support. share – Share that will be created. share_server – Data structure with share server information. Not used by this driver. Returns a list of dicts containing the EVS IP concatenated with the path of share in the filesystem. Creates a new share from snapshot. share – Information about the new share. snapshot – Information about the snapshot that will be copied to new share. snapshot – Snapshot that will be created. share – Share that will be deleted. snapshot – Snapshot that will be deleted. share – Share that will be checked. Ensure that snapshot is exported. context – The context.RequestContext object for the request. snapshot – Snapshot that will be checked. Returns a list of dicts containing the EVS IP concatenated with the path of snapshot in the filesystem or None if mount_snapshot_support is False. Extends a share to new size. share – Share that will be extended. new_size – New size of share. Track allocations_number in DHSS = true. When using the setting driver_handles_share_server = false does not require to track allocations_number because we do not handle network stuff. Manages a share that exists on backend. share – Share that will be managed. Returns a dict with size of the share managed and a list of dicts containing its export locations. Manages a snapshot that exists only in HNAS. The snapshot to be managed should be in the path /snapshots/SHARE_ID/SNAPSHOT_ID. Also, the size of snapshot should be provided as –driver_options size=<size>. :param snapshot: snapshot that will be managed. :param driver_options: expects only one key ‘size’. It must be provided in order to manage a snapshot. Reverts a share to a given snapshot. snapshot – The snapshot to which the share is to be reverted to. share_access_rules – List of all access rules for the affected share. Not used by this driver. snapshot_access_rules – List of all access rules for the affected snapshot. Not used by this driver. Shrinks a share to new size. share – Share that will be shrunk. Update access rules for given snapshot. Drivers should support 2 different cases in this method: 1. Recovery after error - ‘access_rules’ contains all access rules, ‘add_rules’ and ‘delete_rules’ shall be empty. Driver should clear any existent access rules and apply all access rules for given snapshot. This recovery is made at driver start up. 2. Adding/Deleting of several access rules - ‘access_rules’ contains all access rules, ‘add_rules’ and ‘delete_rules’ contain rules which should be added/deleted. Driver can ignore rules in ‘access_rules’ and apply only rules from ‘add_rules’ and ‘delete_rules’. All snapshots rules should be read only. snapshot – Snapshot model with snapshot data. add_rules – Empty List or List of access rules which should be added. access_rules already contains these rules. delete_rules – Empty List or List of access rules which should be removed. access_rules doesn’t contain these rules. share – Share that will be unmanaged. snapshot – Snapshot that will be unmanaged. Update access rules for given share. share – Share that will have its access rules updated. access_rules – All access rules for given share.